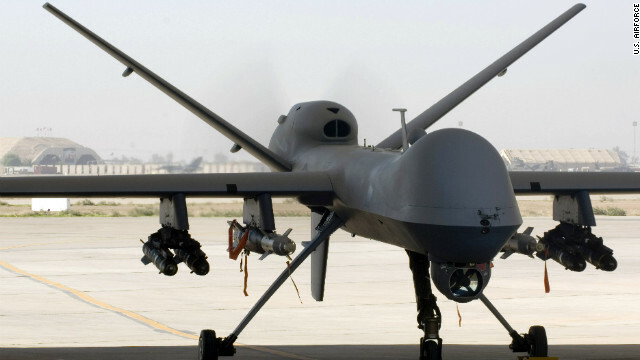 U.S. counterterrorism officials are closely watching an al Qaeda fighter in Pakistan who could become the next American to be targeted for killing by a drone strike, CNN has learned. The person, who was not identified, has been the subject of debate among military commanders and intelligence officials for several weeks as they decide what to recommend. President Barack Obama would make a final decision. I don't think we're killing enough for these guys.we need to keep on killing then and than we need to round up their families and prosecute their families to . One….two….three….FIRE! Swoosh….BANG….threat taken care of………. This is an outrage. What happened to America being a free country, where every citizen has the right to a trial and be judged by a jury of their peers? If he is guilty then by all means he deserves punishment but to kill him and maybe 10 other innocent people without any evidence? HOW SHAMEFUL. Quite true Marty, quite true indeed! Obama is totally amoral. More bs. we have traitors all around and with a turd in office- we cannot get anything done anymore. He is involved in terrorist activities with the enemy in Pakistan, I don't see a problem... Drones should vaporize him and his buddies in Pakistan – whether or not he is a US citizen. He chose to be in Pakistan with the enemy - and that makes him a legitimate target. Good grief Silverado, judging by your posts, you must think that being stupid is some kind of virtue to be displayed and be prided upon. I simply fail to understand you. Another murder waiting to be committed. How repulsive!! !